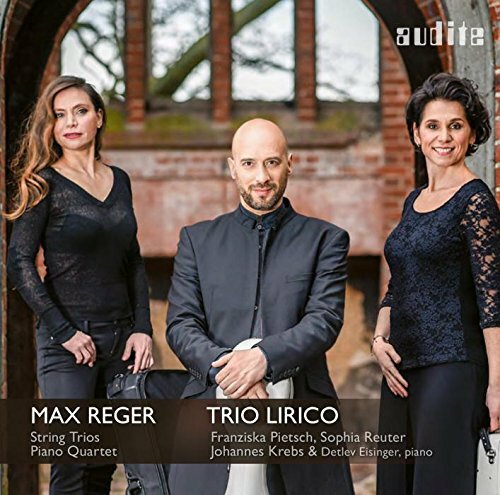 The German ensemble Trio Lirico do an outstanding job here, giving performances that are light and buoyant, with beautiful clarity of texture and finely gauged balance between the instruments. Focused articulation helps to propel the lines, and the viola and cello in particular often display a woody, tactile attack, while the overall tone is suitably balanced between transparency and richness. Pianist Detlev Eisinger fits perfectly into the ensemble to the Piano Quartet. In all three performances, the string players indulge in some sweeping rubato gestures in the transitions—ideal for this music—and Eisinger seems to goad them even further, into daringly broad and opulent phrasing. The gamble always pays off. As with most of Reger’s chamber music, the competition for these three works is select but strong. And, as usual, the benchmark is the MDG series from the 1990s. The string trios there, from the Mannheimer String Quartet (MDG Gold 336 0711 and 336 0722) are weightier in tone and recorded in a warmer and more ambient setting; easier on the ear where these are more confrontational. Interpretively, they are similarly well executed and conveyed, so the two versions deserve joint top billing. But don’t miss the excellent version from the Vogl Trio on Gramola (98943). Thir approach is lighter and more conversational in the counterpoint, lacking a little in drama but still impressive. 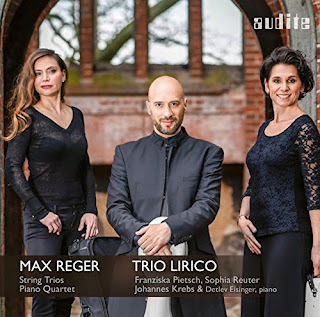 The MDG version of the Piano Quartet, again with the Mannheimer String Quartet, with pianist Claudius Tanski (336 0714) has a compelling sense of urgency in the first movement which Trio Lirico seem to lack, at least by comparison. But the audio quality on the new version is superior, so again it’s a tie for top place. The other versions available are not competitive: The Fanny Mendelssohn String Quartet (Troubadour 1415) is rushed, while the Aperto Piano Quartet (Naxos 8.570786) lacks focus and engagement, and neither version comes close to this or the MDG for audio quality. Generous running time and an unusually well translated booklet round out an attractive package. Just one complaint: The Audite label used to champion SACD. Their new approach seems to be to issue standard CDs, but with a high-resolution, surround-sound download equivalent. I’m sorry to have missed out on that, but it could potentially elevate this joint first into a clear winner.